Elect Custom Hand Fans for Your Political Campaign! Personalized Hand fans are a common sight at summer outdoor events such as concerts, festivals, picnics and more, and it is for good reason. They are an economical marketing tool as they both serve to advertise and act as a giveaway for attendees. They also serve an additional use for keeping audiences cool in the summer weather. As political campaign season heats up, don’t overlook the usefulness of fans to get your message out! This election season has a lot at stake from the perspective of each of the political parties -- so promoting their candidates becomes of the utmost importance from now until November! They have a generous imprint area to really get your logo and message noticed! It's this feature in particular that makes the fans a favorite promotional tool. The possibilities of getting your campaign message out is endless: media coverage whether tv or print can indirectly make your campaign widely visible; attendees to the rallies and events can take them home for souvenirs, spreading your message far and wide. Whether you're democrat, republican, green party, libertarian, progressive or conservative there is a style to suit your political campaign and special issue rally’s needs. 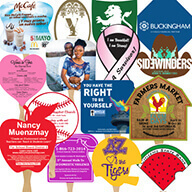 Choose from a variety of stock shapes to print your message. We also have fans with the American flag, Bald Eagle, the Statue of Liberty and more printed clearly and brightly on quality card stock with basswood handles glued to them. (No dangerous and unsightly staples!). Print on a single fan or, for even more impact, get a sandwich hand fan--in which the stick handle is hidden between two heavy card stock fans, giving you two full sides of printing space. They have a functional use as well. People get heated in more ways than one! Not only due to discussing important issues, but convention halls and meeting locations with lots of attendees can become quite warm. Being a useful item for attendees to conventions and rallies will insure that fewer fans will find their way to the trash than flyers and posters might. As mentioned before, many people will keep them for memorabilia or to display at home. They are low cost making them a great investment, as they require little capital for a high value return. With the current political season about to get very hot, consider the "cool" factor of custom hand fans for your political rally and special issue campaign needs! We are here to help you with any questions you might have to help you create the perfect campaign tool to make your event one to remember!